Canadian Rockies Vacations. See the Rockies, Canada's Rocky Mountains Travel Guide. Waterton Lakes National Park was established in 1911, and it was after this that the town of Waterton evolved, mainly for the tourists. 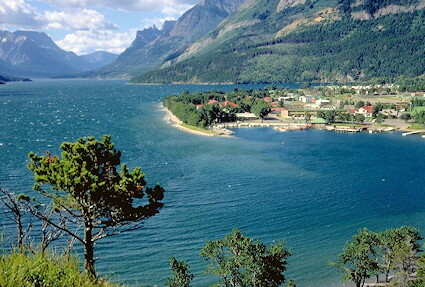 This mountain resort town, located in the heart of Waterton Lakes National Park is the park information centre and offers a complete line of tourist facilities. From the townsite you have easy access to the many outdoor recreational opportunities Waterton Lakes offers; such as hiking, trail riding, golfing, canoeing, backcountry packing and camping. Waterton has motels, hotels, lodges, restaurants, fast foot outlets, shopping, full convention facilities and naturalist programs and other tourist and traveller needs. No local business listings found at this time. Add your listing now. © 2019 See The Rockies - Canada's Rocky Mountains Travel Guide to Vacations in the Canadian Rockies. Website Content Management System from Interactive Broadcasting Corporation.